The Planetary Blues Band is formed by the trio of brothers Martin Schaefer-Murray (guitar and lead vocals) Bobby Schaefer-Murray (bass) and Michael Schaefer-Murray (guitar), with their longtime friend Nick Evans on drums. The band is based in Valparaiso, In. ; less than an hour from Chicago, and has been paying dues in Midwest bars and at local festivals for over fifteen years. They've shared the stage with some of their biggest influences, such as Son Seals and Buddy Guy, including opening up for Buddy Guy at his own club, Legends. The PBB is influenced by a wide range of musical styles. Like most rock bands worth their salt, Planetary got their start playing, and being influenced by, the Blues. The band was born in 1999 in “Mom’s basement”, where countless hours were spent learning entire albums by Chicago Blues greats like Buddy Guy and Son Seals. Over the course of the past 15+ years, Planetary has held onto those roots, while expanding outward into various other corners of the musical universe. 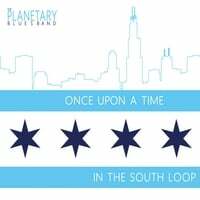 The Planetary Blues Band recorded and produced their most recent album, ONCE UPON A TIME IN THE SOUTH LOOP, all “in-house” (engineered by Michael S-M), and it received stellar reviews internationally. Planetary is formed by the trio of Martin Schaefer-Murray (guitar and lead vocals) Bobby Schaefer-Murray (bass) and Michael Schaefer-Murray (guitar), with their longtime friend Nick Evans on drums. The band is based in Valparaiso, Ind., near Chicago, and has been paying dues in Midwest bars and at local festivals for a decade. The name of the band, and the shortened moniker by which their fans know them – Planetary – exemplifies who they are and what they hope to accomplish.